We are fully equipped to do all kinds of repairs on all acoustic as well as electric guitars, no matter if it´s a little issue, a regular service and setup or a structural repair. We can also repair most hardware if it fails or is worn out, e.g. tuners, bridges and the like. We can partly or completely refret your instrument, giving it a perfect setup to your individual wishes, make a new saddle and nut, clean and polish up your guitar and all other regular service work. 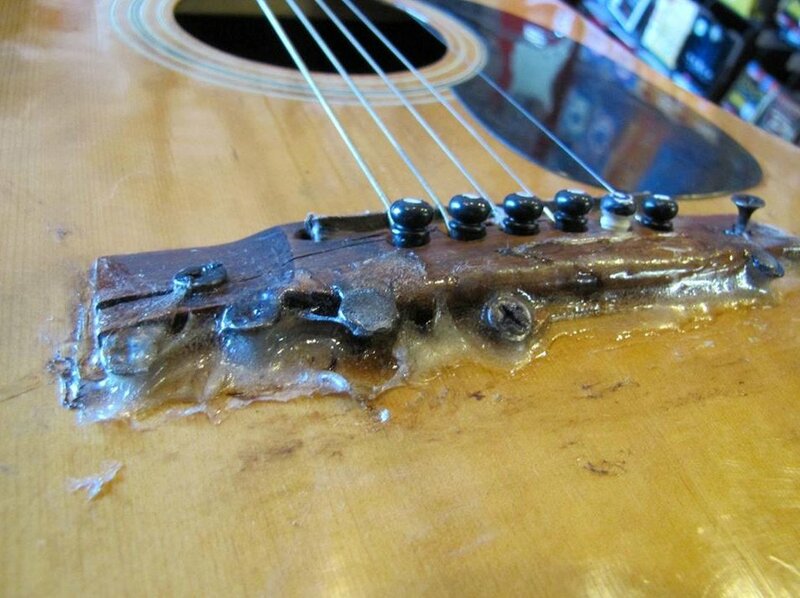 No matter if your headstock is broken, some braces came loose, the bridge lost its integrity, the fretboard is lifting or your pickup system stopped working – we can repair it for you. We also know about the old techniques back from the golden days of lutherie so we can do any repairs on historic instruments of all kinds just like they had it repaired centuries ago. Our specialty are cracked tops on acoustic instruments and masking it in a way you almost can´t see the repair afterwards.